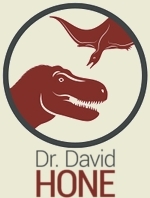 To be perfectly honst, even I’m not too fond of the name “Dave Hone’s Archosaur Musings” but I ended up with it and then it stuck. For those who might be confused I thought I’d set the record straight as although I kinda mentioned it on the Mk. 1 musings, it never got a full exposition. It started (as things are wont to do) more or less on a whim, I was already contributing heavily to the DinoBase forums (as indeed I still am) but rather than being purely reactionary, I decided that despite a previously aborted blog (after all of two posts) it was worth me getting a few ideas out as well. I thought that having my own section on DB woulf allow me to write about things to an already interested audeince, but by being part of a bigger network, there would be no pressure to do so regulalry. However, my own productivity / boredom, soon meant I was racking up the number of posts quickly but was irritated by the lack of visitors. So I did the most obvious thing there was available to me and badgered my friends and colleagues who already had blogs and asked them to promote me on their sites. Of course the immediate question was what to call it. Rather by default on DinoBase it was simply listed as “Dave Hone’s Blog” which not only was not very exciting, but also did not really give much of a hint as to what it was about. The problem was rapidly solved by Darren Naish (pictured with Fodonyx) who simply ‘named’ me himself on his blog, leaving me with the full title you see here. Thus a name was born. 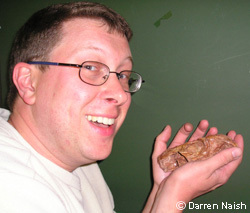 I am indeed Dave Hone, musings is pretty accurate given my lack of citations and links in general, and I certainly do blog on archosaurs (archosauromorphs might be a little more accurate, but I’m not going to split hairs) and so you have it. On balance I would have preferred something a little catchier, but hey, it saves me the trouble of thinking of a name so I can’t complain too much. I’ll be keeping this one short as there is really not much to say, however the photo is a really nice example of how extreme some bits of soem organisms get. While obviously there are some huge bones out there in various organisms (typically revolving around whale and ceratopsian skulls and the odd sauropod humerus) there are also some less likely candidates for biggest (well, OK, longest) bone of the vertebrate world – step forward the cervical rib. This particular one is on display at the IVPP in Beijing and is to my knowldge the best and most complete of its kind. 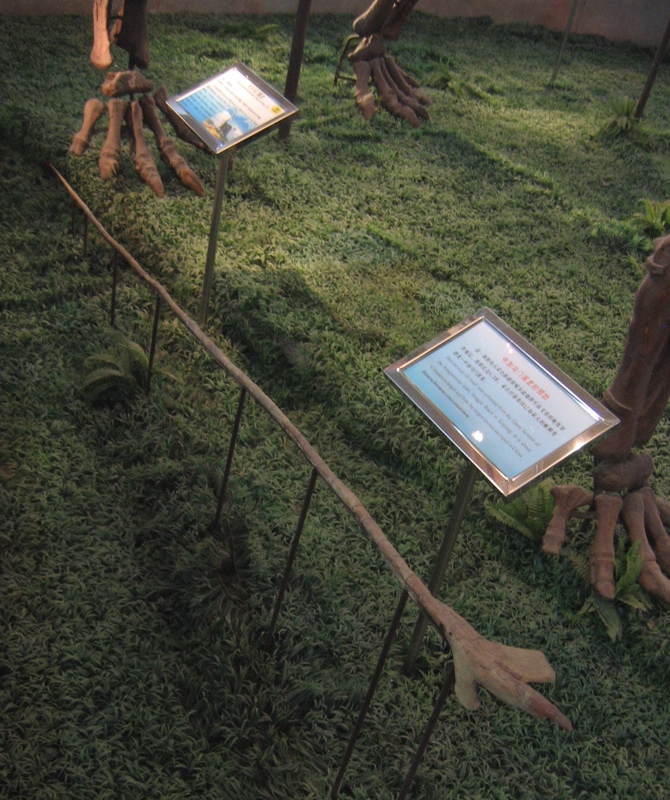 It comes from a specimen of Mamenchisaurs and is a staggering, wait for it, 3.2 m long! Thats right, over three metres and close on 11 feet. For a rib. That fits in the neck. Not surprisingly things like this are not the easiest to find and preserve badly, you can’t see it in the photo, but there is a huge amount of glue holding it together (though it is definitely one piece) as it was essentially shattered when found. Still, it is a real demonstration of pushing simple bones to extremes and raises some interesting questions about the most basic mechanics of these animals. Mamenchisaurs has one of the most extreme necks of sauropods as it is, and support is an obvious function for a rib of this kind (you can see how straight it is, and that it would be held alongside the neck, and presumeably would overlap with the ribs of other cervicals). Still, it begs the question, how on earth did the neck flex with that buried in it, and if the neck did bend, was the rib pliable enough to bend itself? It is a complex question associated with a single simple rod of bone – science can be damned frustrating at times, but half the fun is finding out. Incidentally, the feet in the frame are those of Mamenchisaurs, not the same animal but a reconstruction of one that was probably similar in size, which gives you a feel for just how big that thing is. By chance I came across this piece yesterday and though it worth sharing. Again it features me being quoted (this time alongside Dong Zhimin – yay) so of course you should all be desperate to read it, but it is interesting in its own right. While the story of the Chinese eating dinoaur bones as ‘medicine’ is hardly new – the source certainly is – a colossal new Late Cretaceous dinosaur bearing formation in China’s Henan province. 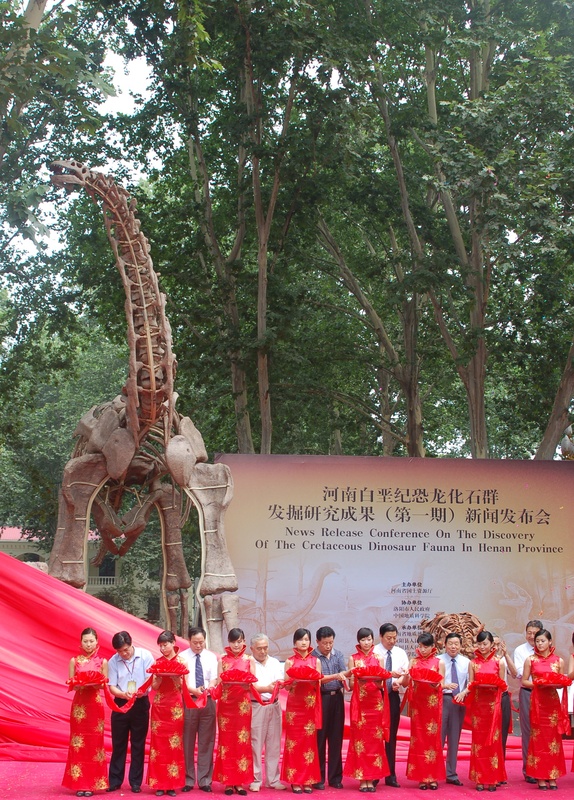 Those keeping up with the literature might have noticed a trickle coming out Henan (like the sauropod Huanghetitan [pictured] and the ankylosaur Zhongyuansaurus) and into the public realm (mostly thanks to Jungchang Lu [pictured] who has been the project leader out there) but I can assure poeople there is plenty more to come. Jungchang was kind enough to invite me out there as an advisor during a site viewing last year and progress has been good. While obviously I can’t talk about other people’s research, there are exciting new discoveries being made (which includes new taxa) and the possible age of the horizon could bring great excitiment. As ever, you’ll have to wait for the papers to come out, but the future is very bright in China beyond the already ludicriously rich beds of Lianoning and Xinjiang. Readers of the Mk. 1 blog will know I run an ongoing battle with the media over their portrayal of science and scientists and this recent article allows me to do two things. First of all its a nice bit of self aggrandising because I get mentioned alongside Xu Xing and Peter Dodson (while, errr, talking about the Chinese space program), but secondly it allows me to illustrate a point about how some articles are put together. 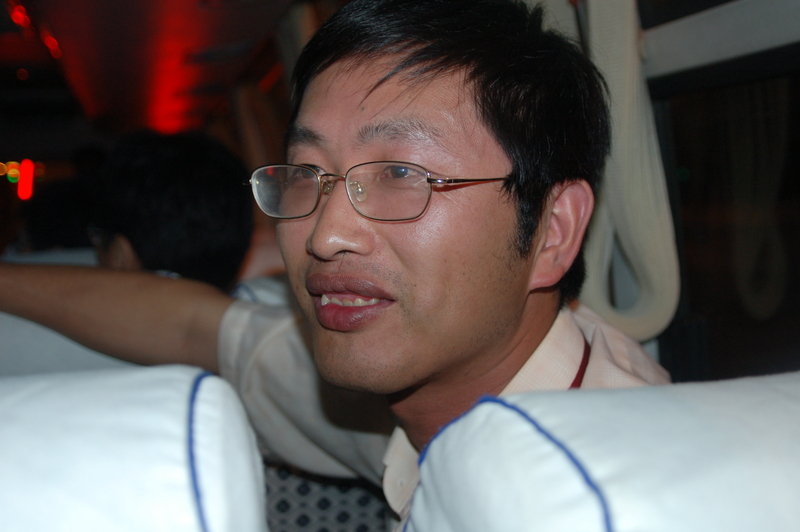 Obviously I met the guy who wrote the article and he was genuinely interested in Xu and his work and tried to get to how he became a palaeontologist and what it meant to him. While I appreciate that to a degree you have to have an angle to see a story to the public as a journalist, it is also true that writing the story you want to, and the one your editor wants are not necessarily the same thing. Note how these two lines appear in the bulk of the text “(Roy Chapman) Andrews is often compared to Indiana Jones” and “Xu plays down any comparison of himself to Andrews”. OK, fair enough, but why then does the opening paragraph call Xu Xing “China’s real-life Indiana Jones”? Hmmm, is it becuase a new film is out and it makes the story sound really exciting? Even though the fieldwork barely gets a mention and the story is about his academic history? Could be…. This has been a long time in coming and I do hope I will pickup some new readers here, so it seems practical to give myself an introduction to you. I started blogging briefly around 2 years ago and gave up thaks to a lack of motivation before getting more and more involved in the Dinobase forums and eventually blogging on there heavily. However, the limitations were obvious (no RSS, no images, unwieldy comments system etc.) and it was always my intention to move on once I had managed to get past the, errrr, internet difficulties of my current host country. Now here I am, and with a bucketload of old blog posts dragged over, given a general spruce up and a few photos added. Even if you have read everything I have done before, its worth a quick peek to see the new images and if you are new here, its worth a trip to the old site to see all the posts that did not make the move, and the original comments of those that did. My blog tends to be pretty technical a lot of the time, so might not be accessible to many readers, though I often deal with the wider issues in science, research and education as well as musing on archosaurs. Onto the main thrust of this ‘first’ post – who I am and what I do. Well, the name at the top of the page should be a give away, and the general topic is quite clear too. Still “archosaurs” is a big topic and there is lots to do within this huge and important group of reptiles, so perhaps its easiest to talk about how I got here. I have always been obsessed and fascinated by animals and it really was inevitable that I would end up in academia, just a question of when and how. While at high school I was working in London Zoo as a volunteer keeper ad got to ‘play’ with giraffe, okapi, rhino, oryx and others on my weekends. My batchelors degree was in zoology where I specialised in locomotion and behaviour more than anything (with lots of ecology, cladistics and fish biology). 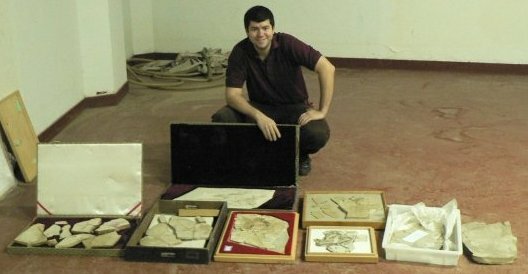 This was followed by a Masters in taxonomy (with a healthy sprinkling of cladistics, macroevolution and conservation) and then a chance twist in the course of my masters thesis led me into looking at dinosaur evolution and thence onto a PhD with the great Mike Benton in vertebrate palaeontology where I focused on the origin of pterosaurs. 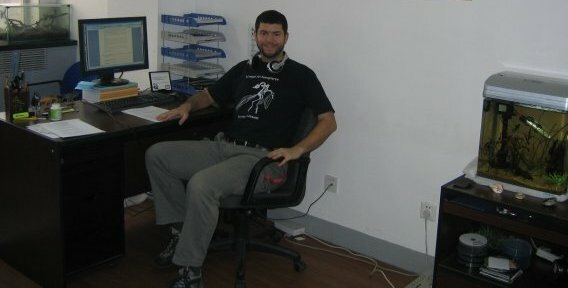 From here I got a postdoctoral position with Oli Rauhut in Munich working on sauropod phylogenetics and after that was lucky enough to land another position in Beijing with the legendary Xu Xing working on theropod ecology and evolution. That is about as short as I can keep it really. 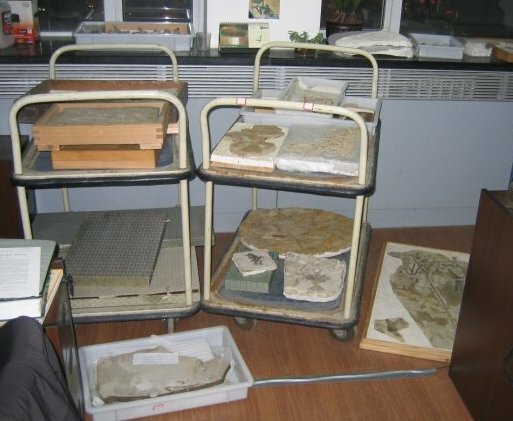 As for my research themes, they are varied and I do tend to jump around a great many subjects, having all kinds of pots boiling and working with quite an array of collaborators on various aspects of archosaurian evolution. The pterosaurs and theropods form the primary subects of my research, and to them I a happy to analyse factors like ecology, evolution, phylogenetics, size changes, behaviour, functional morphology and mechanics, sexual selection, and good old taxonomy. It keeps me busy. Outside of the fundamentals of research I am very keen of science communication, and getting to grips with the public. As a result I founded and run Ask A Biologist (which is rather self explanatory) and act as an administrator on Dinobase, in addition to writing this blog, and I still have a few more projects that are gathering momentum and I hope will be launched soon. That should keep people going for now. It just leaves me to say ‘welcome’, plug in an RSS, drop in a comment or two and take a look around. Oh, and thanks to Luis Rey for the use of his magnificant artwork for the banner. This post is a combination of several from the Mk.1 version of the musings. The theme of ‘the state of palaeontology’ ran over a couple of weeks and ultimately ran to eight posts. The main body of the survey I will simply link to in the middle of this post and leave you here with the introduction and summary. Well of course after singing the praises of academia, it was only inevitable I would turn to the areas I do not enjoy quite so much. At the risk of becoming a caricature of myself, I will try not to complain too much, but frankly it is hard. The issue really is the absurdity of it all and the way it is portrayed by those who do not realise the problems and pressures we face. While I am hardly political, it is difficult to swallow the endless platitudes about how important science is and how we must protect academic freedom, and maintain standards when grants are cut, salaries are a joke, competition for jobs is fierce to the point of brutal, and job security is virtually non existent. I may have to revisit some of these ideas later as they genuinely are that important to the problems faced by academics as a whole, but for now I will try to keep it short. Anyone who has read more than three or four posts on here will by now have realised that I tend to be a miserable sod and just spend my time complaining. Oddly enough I genuinely have a pretty sunny outlook on most things, but I do get annoyed easily, especially by things that I think can be easily changed (like getting the word dinosaur and pterosaur not mixed up, and no I am *not* revisiting that here). Despite all that, I do genuinely like my job and despite the things that cause a neural aneurism to me almost daily, it is great fun – if I ever had to stopeing an academic I literally have no idea what I would do instead. There are a few biology-based things that appeal, but I know I would be bored of them in a few years, if not a few months, so I am glad that my job genuinely has me excited to go into work most mornings (even if it fades once reality kicks in). Anyway, I thought it would be nice for me to be all fluffy for once and talk about how great my job is, and just so you know it is still me writing this, I’ll follow it up with a post of what is, shall we say, less good. Assuming things go to plan (so no chance there then) I’ll soon have to bury myself properly into the (small) world of anurognathids. I’m looking forward to it as they are a truly fascinating group of pterosaurs. Of course every clade no matter how big or small has some unusual trait that will make it interesting to an expert in the field, if only as a quirk – pteranodontids have a great fossil record, azhdarchids are huge, dimorphodontids have their place in history, dsungaripterids have their great skulls and the anurognathids? Well, they have everything. With the recent publication of a new paper on pterosaur ecology it seems like a good time to strike up on the vexed topic of determining (or trying to) the palaeobehaviour of many animals. Actually there is not much to say about it that is not covered in some detail elsewhere (there are a few links here, but obviously check out Tet Zoo and Mark Witton’s site) but I can use the opportunity for another wild stab at people who come up with wildly inappropriate statements about palaeobehaviour. One point that gets repeatedly hammered by the authors is the endless statements (well speculations really) made in the past about pterosaur behaviour when not only were they not backed up by the slightest bit of evidence, but also were obviously false and could be shown to be, as it flat contradicted the basic morphology of the animals under study, or the principles being invoked. This happens alot, and not just with pterosaurs. I understand that when you have described a new taxon or have been working on some functional aspect of an animal, you will want to try and interpret it and put it into context. But that is not a license to write whatever you want, without giving it proper thought and research. It might be a very minor part of the paper, but it should still be treated in a scientific manner. If you have an interesting idea about how an organisms might be acting or what a certain functional model might allow behaviour wise, its relatively simple (especially in the Google Scholar age) to hunt for a few papers on that area in extant taxa for comparison. If the basic principles are funamentally violated by your concept, or the extant organisms practicing it show none of the adaptations your taxon has, it is time to rethink the idea. Sadly, this does not seem to happen as often as you might think. The paper demonstrates this admirably (and Darren comments on it on his blog too) that some ideas just will not die, no matter how much evidence you can provide that rebutts it, or how obviously that concepts flat contradicts our understanding of the funamental biology. The real problem for me, is that these ideas then get picked up and perpetuated in the literature until they become some kind of common consensus, without any back-up at all. Skimming by pterosaurs is a classic example that it taken apart rather ruthlessly by Witton & Naish. Even before the recent paper refuting skimming in pterosaurs on energetic and mechanical grounds, it should have been pretty obvious that no pterosaur really bears even the slightest resemblance even in gross morphology to extant skimmers. That does not rule it out of course, animals can evolve to do similar things in very different ways on occasion (though the rampant convergence of many groups shows that there is often is only one really good way of doing somehing – look at formicivores) but one would expect at least some of the highly specialised adaptations to appear in pterosaurs as they are going to be under similar pressures and experienceing similar problems, and they are easy enough to look for. So why did no-one check, at any point, and instead just recycled the idea again? And then why did other people not notice that this had not been checked and check it themselves, rather than just repeating the idea? It does all get a bit tiring when you keep seeing these unjustified or supported speculations attached to papers. There is nothing wrong with concluding a piece of work with ‘I don’t know’, ‘We can’t tell’, ‘There is no obvious analogy for this’ or ‘This unusual feature is hard to interpret’, and it is certainly better than coming up with some unjustified specualtion that is not only transparently incorrect, but will then be recycled itself. It might seem frustrating that 20 or 30 pages of excellent work could end with ‘Don’t know’, but is that really worse than something incorrect? At the very least researchers (and once more, referees and editors) need to tighten up on this and not let unjustified speculation creep through into print. If you have a good idea, check it. The literature is available and some basic comparisons (like skull shape, foot size, neck length, whatever) can form a very simple basis for comparison and allow the elemination of at least a few concepts and the support of some others. It need not be in depth, that is not the point, but it should at least be supported and currently the opposite is far more common that it should be. This is a modified Mk.1 post, to see the original with comments etc., go here. I am always interested in ways of measuring or estimating the mass of organisms. While estimates are generally given as a range rather than an exact figure (which makes sense of course) the range is generally there to provide for possible errors in the methodology – were the animals good runners so the legs should have a bit more musculature, was the tail a bit longer, were the neural spines a bit longer? But there is also a further component that is rarely considered (or at least not discussed) – how robust (or lets face it, fat) is the animal? Now I am not going to criticise estimates for not considering fat tyrannosaurs (though John Hutchinson for example does work with ‘gracile’ and ‘robust’ morphs which accounts for the possible variation present), but those working from them (for e.g. mechanical analyses) should give them a little more thought in my opinion. While it is easy to look at a human population and spot, shall we say, some highly robust morphs, that is a result of excess food being available, not just changes in form or build. While at London Zoo, I worked with a pair of female giraffe where one was probably half a meter taller than the other, but a fraction of the girth – the latter (while a guesstimate) was probably 10% heavier despite a difference in height (measured) of around 7%, with the shorter animal being the heavier. At a more familiar level, while discussing mass estimates in Munich, my fellow pterosaur researcher Mark Witton revealed that he weighs just 65 kg, compared to my then (to my shame, and I desperately point out, after a major sports injury that had prevented any real exercise for months) almost 100 kg, despite the fact that we are near identical heights and similar in build (well, broad shouldered). Even at my more normal ‘fit’ weight of about 85 kg there is clearly a big difference between us despite our similar height (and build actually, at least in terms of shoulder width). Mark is simply far more gracile than me for want of a better term, despite an apparently similar osteology. Either of us would probably be considered well within the normal range of humans, (and perhaps for other animals – i.e. about 20% for a given size) but it is really quite dramatic. This is a revised Mk.1. post, to see the original with comments etc., go here.